Let's cut through the chase. 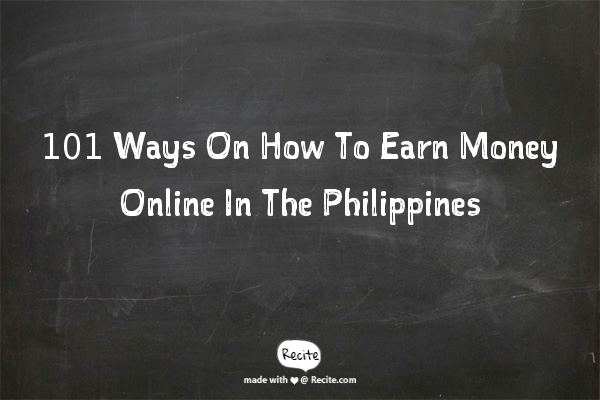 Without further ado, here are the dozens of ways on how you can earn and make money online in the Philippines. You can do most of these in your free time. That is you don't have to quit your regular job. Although it's possible to do this full-time, it's advisable that you pursue these full-time only when you have reached a comfortable income threshold. Don't quit your day-job just yet. Explore these avenues first and see how it goes before you make that decision. Before you take the first step, you have to understand that this isn't going to be an easy work. Understand that you are in this for the long run. Don't expect your blog to start earning moolah the moment you launch it to the world. There are so many factors that will determine if you are going to be successful or otherwise. Here's what you need to do: Find a niche market. If you don't know what a niche market is, please Google it. Find a niche that is aligned or at least relevant to things that you are genuinely interested in. Creating content about a topic you are passionate about will be easier. It will be harder for the well of ideas to run dry. Once you've decided on the subject of your blog, get a domain name, register it, and start churning out content. It's advisable that you build a sizable number of content/articles before you explore your monetization options. There are many ways on how you can monetize your website. You can display advertisements. You can promote affiliate products. You can write sponsored posts. You can even create your own product and sell it on your blog. Again, Google is your friend here. Just go to Google and search for ways on blog monetization. A lot of these blog monetization methods will be discussed further down below. Amazon is the largest online retail site in the world. Almost any product that you can think of is available in their site. Promoting products from Amazon is called affiliate marketing. Basically, here's how it goes: You sign up, you promote Amazon products using your unique affiliate links, you get paid a commission if someone purchases a product through your affiliate link. This can be very lucrative. Sales commissions range from a few cents to hundreds of dollars depending on the price tags of the products sold. For instance, if you sold a laptop worth $200 and the affiliate commission rate is 6%, you will get a commission of $12. Not bad, right? And yes, Amazon accepts affiliates from the Philippines. You are going to need a website or blog where you are going to promote the Amazon products. You can display the products in your website's side-bar. You can write in-depth reviews about the products. You can subtly promote the products within the articles that you write. The more people you send to the Amazon website, the more money you will earn. Again, you are going to need a blog or a website for this to work. It's worth mentioning here that you can only apply for an Adsense account if you have a site. Adsense employees will review your website and decide if it's a right fit for their advertising program. You will be notified if you are accepted into the program. To increase your chances of being accepted by Adsense, make sure that your website is well-designed and that it contains a lot of valuable content. Be warned that there are certain topics and themes that are prohibited in the Adsense program. You should look these up and make sure that your website is not violating any of them before you apply for an account. If you think you can write, this is something you might want to check out. iWriter is a freelance writing website where you write articles and be paid for your efforts. How much you are paid depends on your overall rating in the site. There are four levels of writers in iWriter: Standard, Premium, Elite, and Elite Plus. Standard writers get paid $2.5 for a 500-word article. Premium writers are paid $4.9 for the same article. For Elite and Elite Plus writers, the rates vary but the rates can go as high as $100 for a 500-word article. You can only reach the Elite and Elite Plus levels if you consistently write high-quality articles that get high ratings from article requesters. iWriter pays via Paypal. You can choose to be paid every week or twice a month. Payout minimum is $20. Sign up with iWriter right now! Are you familiar with Amazon Mturk? Because Spare5 works the same way. You will be doing small tasks and be paid for your efforts. These tasks can be anything from creating tags for images to looking for the contact information of certain individuals or businesses. Depending on the number of tasks available when you log in, it's possible to earn a couple of dollars within an hour. The work can be boring and redundant but it's easy work that you can do in your spare time. There's an app for the site so that you can work on tasks while you're on the bus on your way home. Spare5 pays every Friday through Paypal provided that you've reached the $1 minimum payout. Read our Spare5 review for more information about the site. Clickworker follows the same business model as Amazon Mturk and Spare5. You do menial tasks and you will be paid for your efforts. It's a little bit difficult to gain access to jobs in this site because there are always tests and assessments that you need to take. Be sure to read the guidelines before you take the assessments to improve your chances of passing them. Clickworker pays via Paypal. Read our Clickworker review for more information about the opportunity. What is Postloop? Basically, this is a site which owners of forums pay to direct their members and post on the forums. After signing up with Postloop, you will be provided with a list of forums and blogs where you can participate and post comments. You will be paid for every forum post and blog comment that you make. If you are a fast poster, you can make $1 to $2 in an hour. That's about 90 pesos in an hour. That's above minimum wage in the Philippines. Read this Postloop review for additional details. Filipinos are among the most active users on Facebook. Chances are most of the people you know are active users of the networking site. You may also have come across people who are selling items like clothes, computers, and gadgets on the site. You can follow their example by offering your stuff for sale. You can choose to sell people near you or you can also offer shipping options. Just make sure that you have an efficient ordering and payment system in place. It's highly recommended that you create a Facebook Page (this is different from a Facebook Profile) for your store. Safety tip: only sell and ship to people whose identities you are able to verify. There are a lot of scammers on Facebook who would disappear or deactivate their profiles once you've shipped them your products. Essays.Ph is a freelancing website run by Filipinos for Filipino freelance writers. The rates for the articles are really low but if you are a fast writer, it can still be a decent source of additional income. Here's a tip: Go for topics that you are familiar with so that you don't have to do extensive research. If you can write a 1000-word article in under an hour and be paid for a few hundred pesos, that's still good money. Essays.Ph also follows a writer-ranking system. Experienced writers who consistently turn up high-quality work are promoted to higher levels where the jobs pay more. Essays.Ph pays via direct bank transfer, cash remittance, Gcash, and Western Union. The site also has a forum where you can connect and interact with fellow writers from all over the Philippines. The site claims to have over 70,000 freelance writers. This a freelance writing site where you can write and edit articles for clients. Unlike other writing sites, the amount you get paid for an article you write or edit will depend on what the client is willing to pay. Zerys is merely the middle man that takes care of the transfer of payment between the client and you. Payment is via Paypal. You will be paid whenever the client approves your work. The problem with Zerys is that there's very little work available for Filipinos. Weeks can go by without any jobs available for writers. And if there's a job available, the competition is very tough. The jobs get claimed just minutes after they're posted. With that said, don't expect too much from Zerys. You'd be lucky if you can get a job or two in a month. In the simplest terms, Humanatic is a website where you are asked to listen to recorded phone calls. You will then be asked a simple question like "Did the caller connect to a qualified agent?" You are usually provided with multiple-choice-type questions so all you need to do is click on your mouse. It's not that hard to make a few dollars in Humanatic in under an hour. Some of the site's most prolific reviewers make more than $50 a day from the site. Dozens of jobs and gigs are posted on Craigslist Philippines every day. Just head over the "Jobs" section and browse through the listings. The gigs are organized into categories so that you can search in the categories that are relevant to your expertise and skills. If you are a graphics designer, you can go to the Art/Media/Design category. If you are a freelance writer, you can head over to the Writing/Editing section. Here's a tip: Be careful about the gigs and jobs that you do because there are a lot of scammers in the site. Want to make a quick hundred bucks? Then you should try submitting a list article to Listverse. But before you do, make sure that you visit the website and read several of the list articles published there to get an idea about the type of content that they're looking for. Basically, the article you submit should contain at least 10 list items and should not exceed 1,500 words. The main categories of articles in the site are Bizarre, Entertainment, General Knowledge, Lifestyle, Science, and Society. Pick from one of these categories and find an interesting topic that the site hasn't already covered. Listverse only pays their writers through Paypal so get a Paypal account first if you don't have one. Kicker Daily News is a popular website based in the Philippines. We don't know how much they pay their writers but according to their website, writers are paid on a per article basis plus a cut of the site's revenue. They require applicants to have excellent American English writing skills. They also prefer those with degrees in Mass Comm, Journalism, English, Literature, and Marketing. However, you can still apply even if you don't have a degree as long as you can provide proof that you have a published article in a news site. They are also looking for full-time writers only. Apply for Kicker Daily News. Reddit is a great place to find gigs or learn about opportunities that can earn you extra cash. The trick is to find subreddits that are focused on these topics. For example, there are subreddits about writing sites where freelance writers share tips about the sites they write for. Three subreddits that we highly recommend for Filipinos are Beermoney, WorkOnline, and SlaveLabour. There are tons of other subreddits in the site that focus on other niches like design, graphics, programming, etc. HotCopy is a content writing site where you get paid writing articles for clients. Your pay rate depends on your level. There are three levels of writers in the site: Standard, Advanced, and Pro. Standard writers are usually paid around $7 for a 500-word article. Pro writers can get up to $25 for an article with the same word count. For additional details, read our HotCopy review and see if the site is suitable for you. This is a writing platform where you can submit articles you wrote to the "marketplace" pool. People looking for content can purchase your articles at a fixed price. One advantage of this site is that you decide how much your articles are worth. It's you who places the prices on the articles. For more information, read our Content Gather review and decide for yourself..
Dropshipping in the Philippines is fairly new but there are those who are already raking in the cash using the method. What's great with the strategy is that just like affiliate marketing, you don't need to keep any inventory. The products that people buy from your online store will be shipped to customers by your supplier. The other ways on how to make money online are coming soon. So stay tuned. If you know of a way on how to earn money online in the Philippines that wasn't discussed above, feel free to tell us about it in the comments section below. Thanks a million.